In 1948 Harry Truman had a 38% public approval rating and all the polls and news media predicted he would lose the election. 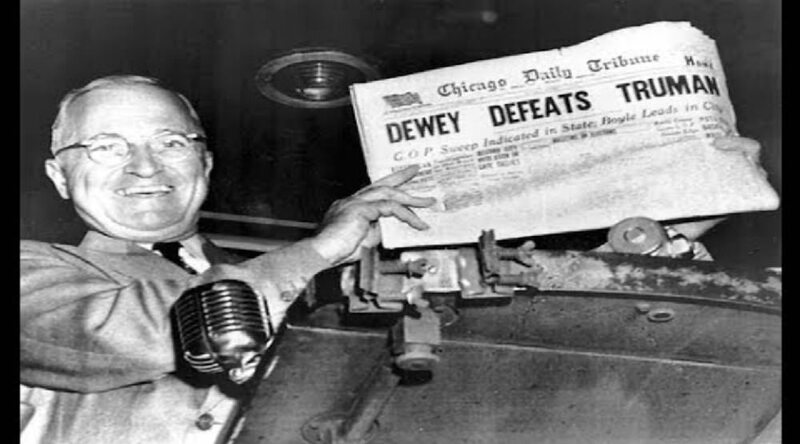 They were so sure that he would lose that several newspapers put out headlined early editions giving his opponent credit for winning. Harry Truman was the only Democrat president that I have admired and respected. He was what a Democrat was supposed to be. He was steadfast and would not be influenced by anyone inside and outside of the government. His famous saying of “The buck stops here” was a black eye to politicians on both sides of the aisle. He did not favor one party over the other and by doing so both sides of the aisle had a better working relationship to get things done. Harry did not have a college education and he was very outspoken and often offended people he disagreed with. He was cut and dry and made iron clad decisions. He was fair and the people respected him for it. Today we don’t have to look too far to find a man who could very well wear the same hat that a former Haberdashery wore. Donald Trump has one trait that is different, he is a Republican.